JoAnn Carmin, Nicole Darnall and Joao Mil-Homens, Stakeholder Involvement in the Design of U.S. Voluntary Environmental Programs: Does Sponsorship Matter? 31 The Policy Studies Journal 528 (2003). JoAnn Carmin, Nicole Darnall and Joao Mil-Homens, Stakeholder Involvement in the Design of U.S. Voluntary Environmental Programs: Does Sponsorship Matter? 31 The Policy Studies Journal 529 (2003). Panagiotis Karamanos, Voluntary Environmental Agreements: Evolution and Defintion of a New Environmental Policy Approach, 44(1) Journal of Environmental Planning and Management, 70 (2001). Panagiotis Karamanos, Voluntary Environmental Agreements: Evolution and Defintion of a New Environmental Policy Approach, 44(1) Journal of Environmental Planning and Management, 78 (2001). Panagiotis Karamanos, Voluntary Environmental Agreements: Evolution and Defintion of a New Environmental Policy Approach, 44(1) Journal of Environmental Planning and Management, 68 (2001). Panagiotis Karamanos, Voluntary Environmental Agreements: Evolution and Defintion of a New Environmental Policy Approach, 44(1) Journal of Environmental Planning and Management, 74 (2001) . Nicole Darnall & Joann Carmin, Greener and Cleaner?The Signaling Accuracy of U.S. Voluntary Environmental Programs，38 Policy Sciences 79 (2005). John W. Maxwell & Christopher S. Decker, Voluntary Environmental Investment and Responsive Regulation, 33 Environmental & Resource Economics 425–439 (2006). JoAnn Carmin, Nicole Darnall and Joao Mil-Homens, Stakeholder Involvement in the Design of U.S. Voluntary Environmental Programs: Does Sponsorship Matter? 31 The Policy Studies Journal 533 (2003). OECD , Voluntary approaches for environmental policy: Effectiveness, Efficiency and Usage in Policy Mixes，OECD Publication (2003). Dorit Kerret, Greenwash or Green Gain? Predicting the Success and Evaluating the Effectiveness of Environmental Voluntary Agreements，14 Penn St. Envtl. L. Rev. 46-48 (2005) . Dorit Kerret, Greenwash or Green Gain? Predicting the Success and Evaluating the Effectiveness of Environmental Voluntary Agreements，14 Penn St. Envtl. L. Rev. 48 (2005). Toddia A. Steelman & Jorge Rivera, Voluntary environmental programs in the United States: Whose interests are served? 19 Organization Environment 512 (2006). Nicole Darnall & Joann Carmin, Greener and Cleaner?The Signaling Accuracy of U.S. Voluntary Environmental Programs，38 Policy Sciences 72 (2005). OECD, Voluntary approaches for environmental policy: Effectiveness, Efficiency and Usage in Policy Mixes, OECD Publication,11 (2003). Nicole Darnall & Joann Carmin, Greener and Cleaner?The Signaling Accuracy of U.S. Voluntary Environmental Programs，38 Policy Sciences 77 (2005). OECD, Voluntary approaches for environmental policy: Effectiveness, Efficiency and Usage in Policy Mixes, OECD Publication, 19 (2003). Nicole Darnall & Joann Carmin, Greener and Cleaner?The Signaling Accuracy of U.S. Voluntary Environmental Programs，38 Policy Sciences 77, 81 (2005). 参见Nicole Darnall & Joann Carmin, Greener and Cleaner?The Signaling Accuracy of U.S. Voluntary Environmental Programs，38 Policy Sciences 77 (2005). OECD, Voluntary approaches for environmental policy: Effectiveness, Efficiency and Usage in Policy Mixes, OECD Publication, 20 (2003). Patrick ten Brink, Voluntary Environmental Agreements: Process, Practice and Future Use, Greenleaf Publishing, 18 (2002). OECD ,Voluntary approaches for environmental policy: Effectiveness, Efficiency and Usage in Policy Mixes，OECD Publication, 19 (2003). OECD,Voluntary approaches for environmental policy: Effectiveness, Efficiency and Usage in Policy Mixes，OECD Publication (2003), 18-19. Patrick ten Brink, Voluntary Environmental Agreements: Process, Practice and Future Use ,Greenleaf Publishing, 19 (2002). OECD,Voluntary approaches for environmental policy: Effectiveness, Efficiency and Usage in Policy Mixes，OECD Publication, 19 (2003). Seema Arora & Timothy N. Cason, An Experiment in Voluntary Environmental Regulation: Participation in EPA’s 33/50 Program, 28 Journal of Environmental Economics and Management 273-274 (1995). Superfund Program, De Minimis Landowner Settlements, Prospective Purchaser Settlements, 54 Fed. Reg. 34235 (Aug. 18, 1989). 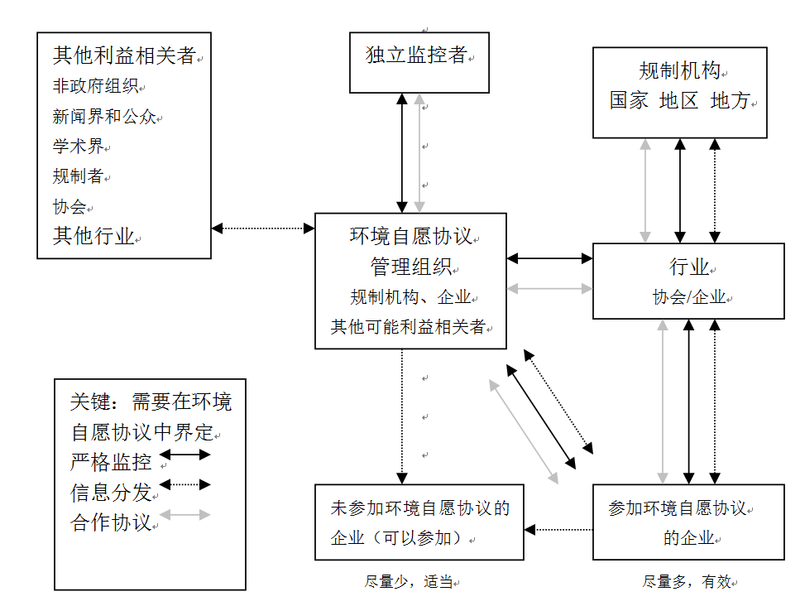 Lynn Price, Ernst Worrell, Jonathan Sinton, Voluntary Agreements in the Industrial Sector in China，Lawrence Berkeley National Laboratory, Berkeley 4 (2003).